A month ahead of Vladimir Putin's visit to Japan, where the two countries hope for historic breakthroughs, RBTH launches a series of articles about Russia-Japan relations. There are several places in both countries that are closely associated with the history of Russia-Japan relations. There is even potential to design a Russian-history themed tour in Nagasaki or a similar visit to Japanese sites in Vladivostok. RBTH chooses five cities where some interesting and almost-forgotten incidents of Russia-Japan history took place. This Japanese city has the distinction of hosting two Russian heads of states, albeit with a gap of a century. Nicholas II, who was then the crown prince of Russia, visited Nagasaki in 1891. One hundred years later, the first and last president of the USSR, Mikhail Gorbachev visited the city. Nicholas II, who took a great interest in Japanese culture, got a local artist to attach a dragon tattoo on his right arm. Gorbachev, on the other hand, was not keen on following suit. Nagasaki’s connections with Russia can be traced to the middle of the 19th century. The city’s port became one of the first to be opened to trade with Russia in 1855. Following the establishment of trade relations, a small Russian village was set up near Nagasaki. The village, which existed till the 1917 revolution, had a chapel, pubs and a cemetery. Russia’s first consulate in Japan was opened in Hakodate in 1858. The diplomatic mission was headed by renowned Orientalist Iosif Goshkevich. Three years after the opening of the consulate, an Orthodox monk named Nicholas consecrated the first Russian church in Japan. The monk subsequently moved to Tokyo and was known as Archbishop Nicholas of Japan. The consulate moved to a newer building in 1908, while the church was rebuilt in 1916. Both buildings are now protected cultural monuments. While many Japanese people have heard of Hakodate’s Russian connections, few know about the eminent Russian historical figures that visited Nikko, a small city in the Tochigi Prefecture. Russian artist Vasily Vereshchagin painted a series of remarkable oil on canvas works of the Toshogu Temple in Nikko in 1903. The paintings are now on display at the Russian Museum in St. Petersburg. Vereshchagin was killed a year later, along with all the crewmembers of the Russian naval ship Petropavlovsk, when it was destroyed off Port Arthur during the Russo-Japanese War. In 1918, Nikko also played host to Alexander Kolchak, a Russian admiral who fought against the Bolsheviks. In September 2016, Shinzo Abe said he wanted to visit a place in Vladivostok that is closely associated with the history of informal relations between Russia and Japan. He was talking about a sports club, where Russia’s first Judo club opened in 1914. The club was set up by Vasily Oshchepkov, a student of Kano Jigoro, the founder of Judo. Oshchepkov, who mastered the Japanese martial art, was also the founder of Sambo, a Russian martial art. The Vladivostok Judo Club’s building has been preserved. Right next to it is a monument to Oshchepkov, his Japanese friend and rival Hidetoshi Tomabechi, and Kano Jigoro. In November 1997, the leaders of Russia and Japan held an informal meeting near the Siberian city of Krasnoyarsk. 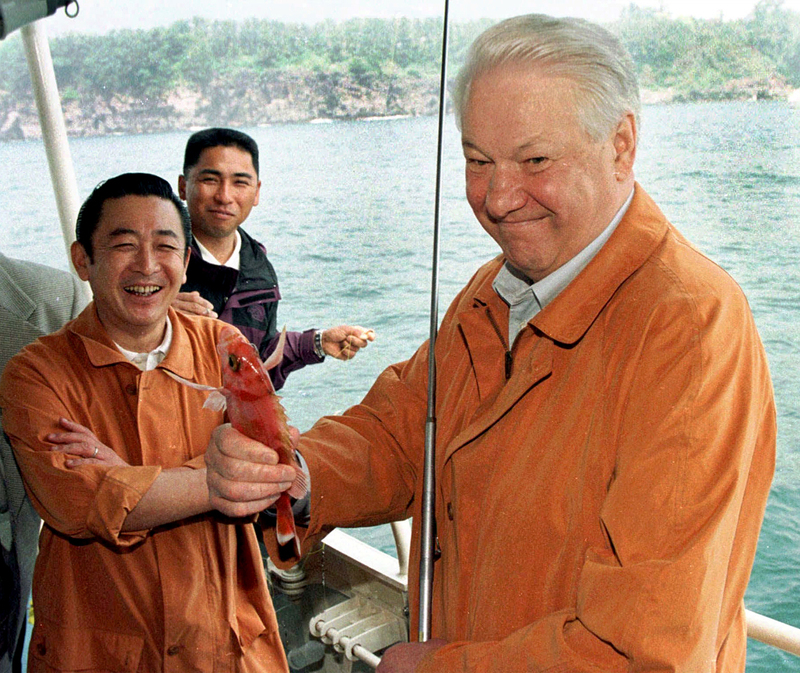 Boris Yeltsin and then Japanese Prime Minister Ryutaro Hashimoto discussed the Southern Kuril Island territorial dispute while fishing on the Yenisei River. It is believed that Hashimoto caught more fish. The leaders established such a strong personal rapport during the fishing trip that they started addressing each other by their first names. Earlier this year, Putin and Abe also decided to operate on a first-name basis.